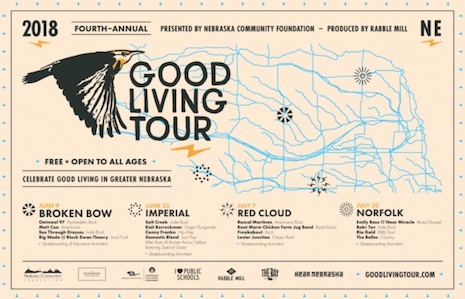 The 2018 Good Living Tour, brought to you by Hear Nebraska. Even though it’s been explained a dozen ways, I continue to run into people who think Hear Nebraska folded when the organization merged with The Bay earlier this year to form Rabble Mill. No matter how many times I tell them that ain’t the case, they don’t listen, probably because the small army of Hear Nebraska photographers no longer are hanging around local shows. Fact is Hear Nebraska is very much alive and kicking. This morning HN announced the 2018 Good Living Tour. 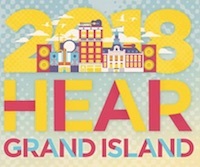 The fourth-annual statewide event combines Nebraska music with skateboarding, and it’s probably the highest profile program HN has put on since the org formed in 2011. This year’s tour locations are Broken Bow June 9 (featuring See Through Dresses and Matt Cox, among others); Imperial June 23 (with Conny Franko); Red Cloud July 7 and Norfolk July 20 (with Bokr Tov). Showtimes weren’t given, but these typically are evening shows in public-square-style locations and they’re always free. More info here. 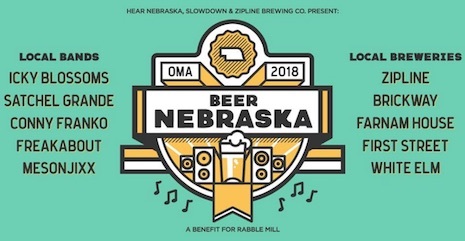 Finally, there’s Beer Nebraska, a fundraiser for Rabble Mill — the umbrella org that houses Hear Nebraska. This one pairs local music and local beer and is being held at The Slowdown Aug. 4. And those bands are Satchel Grande, Icky Blossoms, Conny Franko, FREAKABOUT and Mesonjixx. Pet Shop is hosting a show tonight with Uh, Death Cow, The Natural States and headliner Minneapolis band Dirty Junk. $5, 9 p.m.